TFNation have announced that they are taking orders for their 2nd run of their fan produced Transformers Animated Trial and Error graphic novel which finishes of the series, check out the full announcement below. We are pleased to announce that we are now accepting orders for the limited 2nd run of our TFNation 2017 exclusive fan produced graphic novel, Trial and Error. The book was co-written by noted Transformers historian Chris Mcfeely & AllSpark Almanac author Jim Sorenson with sixty pages of incredible art by Ed Pirrie, Herzspalter & Gavin Spence, luscious lettering by Andrew Turnbull and features a corker of a cover by Josh Perez. The graphic novel is ONLY available to valid TFNation 2017 ticket holders with orders closing on the 10th September at 6pm BST. The book costs £6 plus postage and packaging, international orders are welcome. As with the initial run, this book is a not-for-profit venture and any additional monies remaining having covered the printing and postage costs will be donated to Mary’s Meals. If you wish to register your interest then please email your name, postal address, ticket reference along with the number of the books you wish to order to info@tfnation.com. If you bought your ticket on the door then please state this in the email and we shall validate your details against the forms that were completed during the event. You will be contacted after the 10th September with the final cost including postage and packaging along with details on how to pay. In response to a question asked by Goktimus Prime on Faceboko Madman Entertainment have confirmed that they will be releasing Transformers Animated Season 3 on DVD in 2014. They incorrectly state that this will be the first time it is released anywhere as it has already been released in Japan, however it will be the first release with the original US audio language track. Will you be releasing Season 3 of Transformers Animated on DVD? Yes! For the first time anywhere. First half of next year. You can see the images in this public gallery here. The Allspark Almanac - Cybertronian Optical Code, revealed! Thanks to the tireless Chris McFeely, his Annotated AllSpark Almanac Addendum is now updated! Boy, that's a lotta alliteration! The exciting bit for me is that he cracked my C.O.C., a new cipher I made up just for him, more or less. Didn't figure out that clue, eh? Cybertronian Optical Code, from the episode Decepticon Air! I figured I'd make it not too tricky, so it's a simple variation on Morse code, with circles for dots and half-circles for dashes. To make it slightly harder, I rotated the half-circles around at random, but the orientation is meaningless except to separate upper from lowercase letters. If anyone is interested, you can download Cybertronian Optical Code here. Jim Sorenson posted a new The Ark Addendum yesterday called "The Ark Addendum - Ravage's Transform and The AllSpark Almanac Addendum! " which, as you could have guessed from the title, focuses on the transformation of the Decepticon spy Ravage as well as containing some information on the new AllSpark Almanac content that will feature in the Transformers Timelines publication of this years Botcon comic The Stunticon Job. YouTuber� MichSantona has let us know, via our message board, that he has posted a video review of the unreleased Transformers Animated Electrostatic Soundwave figure on the video sharing network. You can watch the video on YouTube here, o by using the embedded video below. "NEWS TIME! This November- Timelines Issue 6 hits newsstands. This 48 page offering will feature 16 page of Allspark Almanac Addendum content"
What will this content consist of? Well since the last Allspark Almanac was printed we have had more Japanese exclusive recolours, Transformers Animated: The Cool and, of course, this years Botcon set with the comic that featured more characters from the Transformers series. The Allspark Almanacs were created by the "most excellent" Jim Sorenson and Bill Forster so you know that these additional pages are going to be awesome and contain lots of in-jokes and hidden messages. "just finished another TF Animated stuff ;) And it's official stuff =D" he Tweeted." What will it be? Our guess is a comic for the next Transformers: Generations book. Credit to FullMetalHero.com for the news. 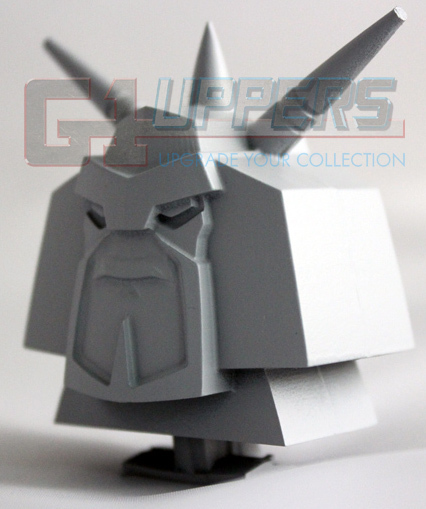 The third-party company who are behind the recently revealed combiner parts for the Botcon Stunticons set as well as the "powermaster" Optimus Prime upgrade for Transformers Animated Optimus Prime that will be known as Firemaster have now revealed themselves as G1UPPERS by creating a blogspot account.� On the blog that reveal that the first images of their designs will be revealed at the upcoming TFcon. 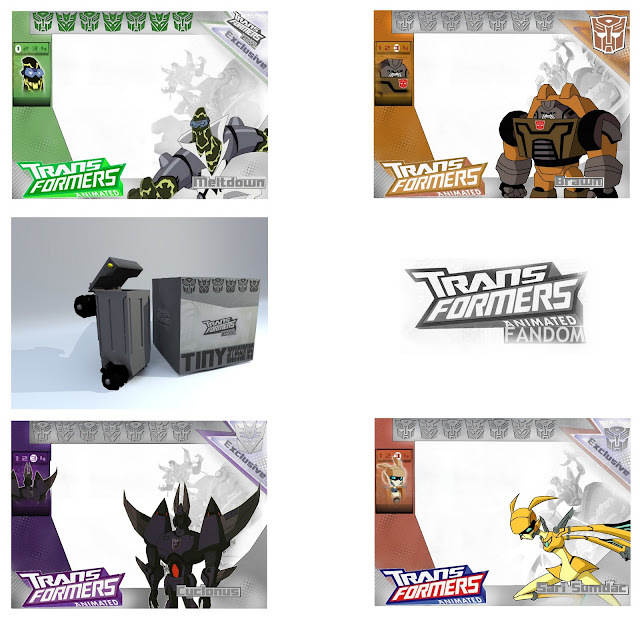 Did you pick up The Stunti-Con-Job comic from Botcon 2011?� If so then you probably noticed the Transformers Animated Mini-conswho were on guard inside the Trypticon prison.� Well the characters were never named within the comic itself, but now thanks to an image that was tweeted by Botcon the named have been revealed as High Wire, Leader-1, Grindor, Sureshock, Reachout, and DUCK-E (Dynamic Universal Cybertronian Kinetic Engineer).! Click the link or image above to view the Dion toy gallery. The gallery contains 24 images of this figure for your viewing pleasure. Page Rendering Time: 1.0151 seconds.